The Network of Entrepreneurial Women is a big proponent of love, and February is the month to celebrate it. 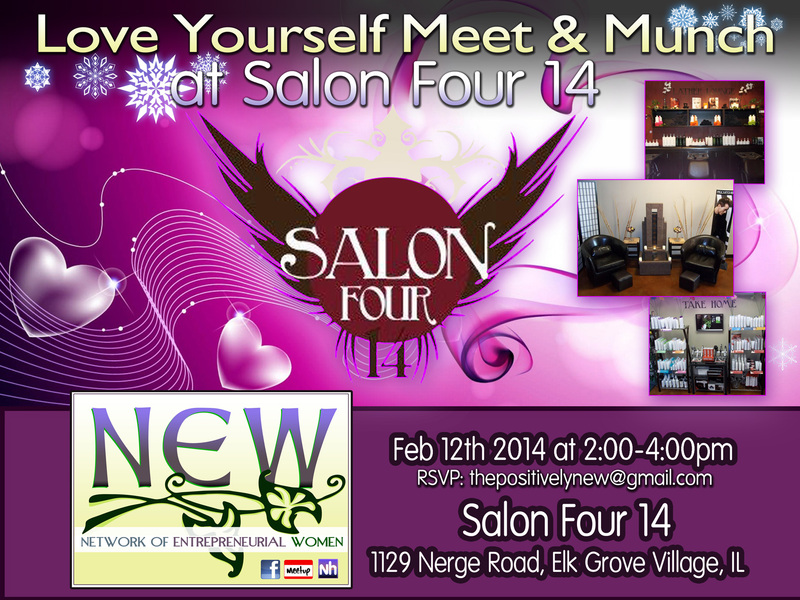 On Wednesday, February 12 our Meet & Munch will feature nurturing connections and sneak peeks of spa treatments at Salon Four 14. Salon Four 14 is a Paul Mitchell focused hair salon that offers a relaxing, professional, yet fun atmosphere including a delicious-sounding Lather Lounge. The salon is located at 1129 Nerge in Elk Grove Village in the strip mall next to Subway and Dunkin Donuts at Nerge Road and Devon Avenue. NEW – The Network of Entrepreneurial Women is a group of Chicagoland business women who are upgrading business networking with fun and creative events that inspire attendees to work together, refer each other and most of all cheer each other on as the membership succeeds. Events rotate around various suburbs on a semimonthly basis, usually the 2nd Wednesday and 4th Thursday of the month. Can’t make this week’s event? We have our Chocolate Cocktails, Women and Wellness scheduled for 6 to 8 pm on Thursday, February 27th at Anna Shea’s. RSVP for our upcoming events at Meetup. You can like us on Facebook, where the events will be listed as well.